Dr. Malwinder Singh Dhami was already an enthusiastic supporter of the University of the Fraser Valley. His elderly father, Ram Singh Dhami, was admitted to the Abbotsford Regional Hospital for treatment. the nursing staff — some of whom were UFV graduates. “As I observed the nurses giving such good service to my dad, I wanted to give back somehow,” Dr.
working. Another donor has stepped forward to add a generous gift to the newly created nursing award. 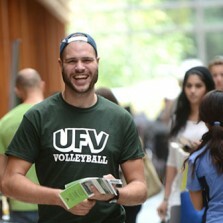 “I believe in supporting UFV because it is a way of giving back to the whole Abbotsford community.